Gibmiss: less is More " Birds"
Oooo Sylvie.. I like this! Lovely colurs - the flowers pop out. I have the opposite afflication to your own - I stick things on and then hate them - because they look untidy! Great colouring and card. 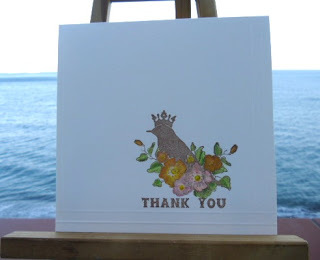 What an unusual funky image, love the crown, colours are glorious .fab card. I love it! I love the image, and I love your colouring, and I love all that white space. Beautiful! I too struggle with lots of blank space. Not sure why though! Fab card Sylvie, love the stamp! Hi Sylvie, I love the colouring on the stamp, brill! I have the same problem with adding bits, I try SO hard to have white space, not so many bits added... just can't help myself, I keep thinking that my white spaces look too empty.......... :-) works on this card though! Fab card - love it! great card and look at the background for the photo - wow! Great card, lovely image and colouring. The embossed lines really help "ground" your image...which by the way, is colored beautifully!